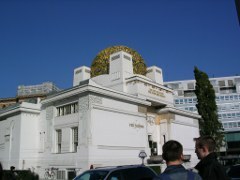 Tourists particularly enjoy guided sightseeing tours in Vienna, such as the Modern tour departing from the Secession building and going along the Wienzeile, the Naschmarkt, the Art Nouveau houses designed by Otto Wagner all the way to the Gurtel road, driving across the Gurtel with a view on the bouche of the Metropolitan Station by Otto Wagner, the new Clinic, the Spittelau incineration plant, the Millenium Tower, going up in the Danube Tower enjoying a panoramic view on Vienna, from the Viennese International Center to the Danube Island seeing the Bigh Wheel, finally stoping for a coffee at the Hundertwasserhaus and finishing with a visit of the Gasometer. Departure from the Secession: The point of departure of the modern guided visit is the bus stop close to the Secession building. If need be, and with a supplement, your guide will pick you up by bus at your hotel or any other wished location in Vienna. 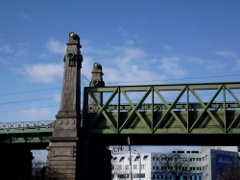 Trip along the Wienzeile: During the first part of the modern tour, your bus will drive you along the Wienzeile street. 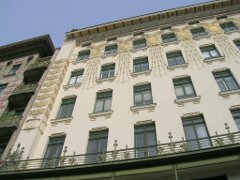 Your guide will take the opportunity to story you on the history of the Naschmarkt and will show you the Art Nouveau houses designed by Otto Wagner as well as the metropolitan bouches. Trip to the Gurtel: You will go to the Gurtel going North to see the archways of the Metropolitan Station by Otto Wagner, the new clinic, the Hundertwasser and the Spittelau incineration plant. 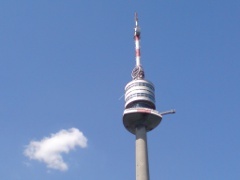 Ascent to the Danube Tower: Your bus will cross the Danube to reach the Tower. Your group and the guide will climb up to the panoramic platform from which you will enjoy a wonderful view on Vienna and Lower Austria. View on the International Center and the Big Wheel: You will be driven to the Viennese International Center next to the towers of the Danube City. The tour continues with a ride to the Reichsbrucke and the Prater, where you will take a peek at the famous Big Wheel of Vienna. Coffee break at the Hundertwasserhaus: Next stop at the Hundertwasserhaus. You will step out of the bus and start a guided visit: au menu, anecdotes and stories about the life and work of Friedensreich Hundertwasser. You will dispose of time to shop for souvenirs and for a coffee break. 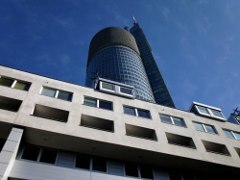 Visit of the Gasometer: Depending on the traffic, your bus will drive you to the "G Tower", a well-known and respected example of modern architecture. 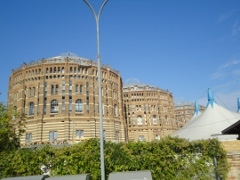 Four former gas tanks were rehabilitated at the end of the millennium by famous contemporary architects for an startling outcome combining housing facilities, shops and leisure areas. CAUTION: this step could be called off in the event that the time necessary for the visit would not be sufficient or because of the traffic so to not encroach on the rest of the tour! Last stop at your wished location: According to your choice, your bus will drive you (after saying goodbye to your guide) to the destination of your choice in Vienna. Please note that this service is available according to the accessibility of the places. 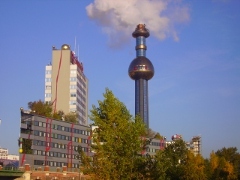 If you were to exceed the time dedicated to the guided tour, the visit will end at the Hundertwasserhaus or at the Gasometer towers. Generally, the modern guided tour lasts approximately 3 hours. You can ask to prolong the guided visit for one more hour - with a supplement - to spend more time at each of the steps or enjoy your time at the Viennese Big Wheel.